The President made these remarks participating in the inaugural ceremony of the EvalColombo2018 held in Colombo, today (17). President Sirisena, addressing the inaugural ceremony further said that the efficiency of the Parliament is not only important for the activities of the House, but also for the activities of the other Advisory Committees, and the activities of these committees have a broad impact on the development of the country. 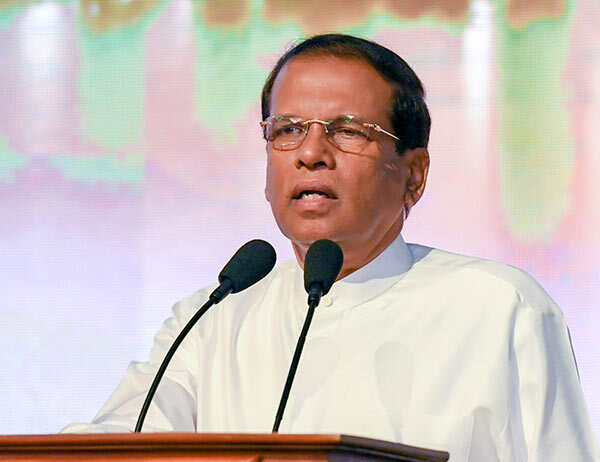 Therefore, the President pointed out the importance of evaluating the value of the Parliament by the MPs and said that the number of days they attend the parliament is the major factor in maintaining the efficiency of the functioning of the Parliament. According to the reports present day women achieved high status in their efficiency, the President said that pointing out the importance of increasing the women’s representation in the Parliament to increase the competence of the parliament and said that he believed that the women’s representation in Parliament should be raised to at least 60% level. Expressing his views regarding the efficiency of the public service, the President said that according to the reports the efficiency of the public sector, which represent 1.5 million human resources, is only 30-35 percent, and it is not a satisfactory situation at all. The Global Parliamentarians Forum for Evaluation together with EvalPartners, the Sri Lanka Parliamentarians Forum for Evaluation, Prime Minister’s Office of Sri Lanka, Parliament of Sri Lanka, and the Sri Lanka Evaluation Association are hosting the EvalColombo2018, a three-day forum from 17th to 19th of September 2018 in Colombo, Sri Lanka, to promote demand and use of evaluation by parliamentarians through dialogue and exchange, generate innovative approaches to tackling them at a global level. Alongside parliamentarians across the globe committed to evaluation, evaluation experts, other international delegates and renowned speakers, will ensure a rich discussion on developing stronger monitoring and evaluation frameworks evidenced-based decision making and accountability in the government. Parliamentarians from across the globe who are committed to the use of evaluation for development, parliamentarians willing to support the use of evaluation as part of building responsible parliaments in their countries and development partners, VOPES and other committed stakeholders are participating in this event. Prime Minister Ranil Wickremesinghe, Speaker Karu Jayasuriya, Chair of the Global Parliamentarians Forum for Evaluation Minister Kabir Hashim, Ministers Rauff Hakeem,Gayantha Karunathilake, Deputy Speaker Ananda Kumarasiri, the President of the Sri Lanka Evaluation Association Prof Saman Bandara and others participated in this event.